Resolutions expressive of the sense entertained by Congress of the gallantry and good conduct with which the reputation of the arms of the United States has been sustained during the late war, by certain officers therein named. February 21, 1815. Washington City: Pr. by Roger C. Weightman, 1815. 8vo. 4 pp. 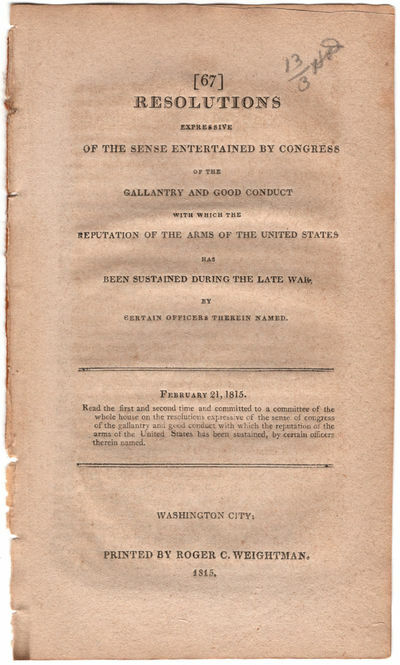 Read the first and second time and committed to a committee of the whole house on the resolutions expressive of the sense of congress of the gallantry and good conduct with which the reputation of the arms of the United States has been sustained, by certain officers therein named." Six resolutions with gold medals and swords to be presented to various officers who saw action on October 5, 1813, near the Moravian village, in the defense of Baltimore, and in other actions during the War of 1812. The officers are as follows: major generals Desha and Henry, brigadiers Allen, Caldwell, King, Chiles, and Trotter, Colonel Johnson, Lieutenant Colonel Johnson, majors Payne and Thomson, Major General Smith, Brigadier General Stricker, colonels Van Rensalear, Fenwick, Newman, Reed, and Williams, lieutenant colonels Mitchell and Appling, Captain Z. Taylor, Brigadier General Swift, lieutenant colonels Backus, Mills, Forsyth, Wood, and Lauderdale, colonels Gibson, Henderson, Williams, and Allen, majors Montgomery, Donaldson, and Cuyler, captains Holmes and Simpson, and "the volunteers who rallied to the defence of the village of Stonington, on the 10th of August, 1814.